Keeping up with me last week was like playing a game of "Where's Waldo". It started off by flying to Minneapolis to go through the Clam plant. You guys are going to be really excited to see what they have planned the next few years. Definitely pioneers in the ice fishing game, they aren't sitting on their heals with what you will see in the future. Next it was off to see my friend and fishing buddy Doc Samson. It wasn't all fun and games, as we spent some time shooting for a DVD that will be coming out shortly. Finally I got to experience my first St. Paul Ice Show. All I can tell you is that if you are into ice fishing and want to go to a show where you can buy products and see the latest and greatest, this is it. 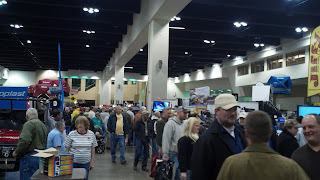 I worked the booth for Clam/Ice Armor and the Ice Team...these booths were literally packed with legendary anglers and guys with a ton of time on the ice. I also noticed that FishUSA.com has gotten a lot of their ice fishing tackle and equipment in already...so if you need anything take a peak on their site. They probably have it and can save you a few bucks. Last but not least I am still catching big old hogs on Erie and you can still book a trip to do it...hit me up. December is like the old November anymore.